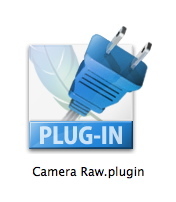 Are there times when you want to capture both Raw and Jpeg at the same time? Absolutely! In this podcast, I go over five instances where I think it's to your advantage to record in both formats. Group Shot is also this month's photo assignment. This is your opportunity to practice, then publish the results. I published a podcast on group shots if you need a quick refresher. You can read more about how to submit on our Submissions page. Deadline for entry is Dec. 31, 2008. Oh, how time flies by. We launched The Digital Story in October 2005. Now, more than three years later, it's time to put a new coat of paint on the walls. In this podcast, I go over the changes we have in store for the next version of The Digital Story. We're going to improve the user experience by updating the underlying technology (Movable Type 3 to Movable Type 4), clean up the navigation, add bigger photographs, add video, and create an entirely new area called Creative Output that focuses on printing and other fun projects. But this is also your opportunity to let us know what you want. If you have a feature you'd like me to add, or if you have a comment on the features we have proposed, please add a comment to these Show Notes or send email to me (see the Submissions page for details). I'm excited to bring the next generation Digital Story to our virtual camera club. I think it's a great way to kick off 2009. Group Shot is also this month's photo assignment. This is your opportunity to practice, then publish the results. You can read more about how to submit on our Submissions page. Deadline for entry is Dec. 31, 2008. 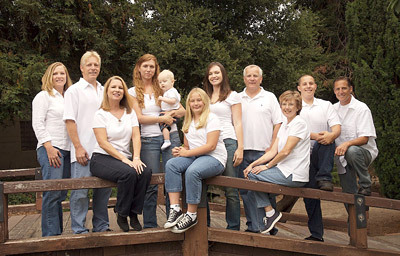 Now that we're smack dab in the middle of the holiday season, group shots are more important than ever. You may want to take one of your family to create your own greeting card. Or you my be the photographer behind the lens at a gathering trying to pull together a group shot. Either way, this podcast will help you get the best image possible. Photographers aren't the easiest creatures to buy gifts for. Most things they need are either too expensive or they already have. So who better than a photographer to recommend holiday gifts for that special snap-shooter in your life? The following list of suggestions are all priced under $100, and many are less that $30. And if you have a great idea that you think should be added to this line up, please post a comment. Joby Gorillapod Flexible Tripod - $21.95 US: The Joby Gorillapod makes taking digital photos more fun than ever. Designed with self-timer photography in mind, the Gorillapod lets you mount your camera just about anywhere you want so that you can include everyone in your automatic shots. This model is for compacts, but they also make larger sizes for all types of cameras. Dynomight Bottle Cap Tripod - $9.95 US: Now you can have a quick and convenient tripod ready for use on your next trip. This convenient bottle cap tripod has a universal camera mount with an adjustable angular design. The cap mounts to any standard bottle top and can easily be dismounted and unscrewed quickly to store in your bag. A fun stocking stuffer! Photoshop Elements software (Mac/Win) - $64.99 (Mac)/$74.99 (Win) ($25 savings): This special offer from the Adobe Store includes free shipping for both versions. The Windows version also includes a Basic Membership to Photoshop.com. These prices are good from Nov. 24 9pm PT through Dec. 10 6pm PT. Photoshop Elements is an outstanding image editor with lots of workflow goodies included. If your favorite photographer is ready to move up to Photoshop, this is a great deal. Gary Fong Lightsphere Universal System Cloud - $49.95 US: The Lightsphere Universal flash diffuser from Gary Fong delivers amazing light from your on-camera flash. You no longer need bulky flash brackets or umbrellas to enjoy incredibly soft, studio-quality lighting! If you've used the original Lightsphere or Lightsphere®-II, you'll find the Lightsphere Universal creates the same great soft portrait light that you love NOW with the addition of an innovative, patent-pending mount that is guaranteed to stay on. Yes, one Lightsphere now fits most flashes. This is a great accessory, and it really works. 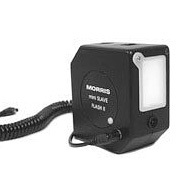 Morris Mini DC Slave Flash II with PC Cord - $31.95 US: Lets you put a little extra light just about anywhere, yet it fits easily in your pocket. Inclues PC cord, tripod mount, and slave that triggers the flash with the flash on your camera. Very handy for the photographer who likes to add a little sparkle to their indoor shots. The Digital Photography Companion - $16.49 US: The Digital Photography Companion gives you creative tips and technical advice for taking top-notch digital photos in a wide range of conditions. Fits easily in your back pocket or backpack. Covers camera controls and pro techniques. The official guide for The Digital Story Virtual Camera Club. Perfect for the beginning photographer or owner of a new Digital SLR. National Geographic Tundra Monopod with Head and Quick Release Plate - $42.00 US: The NG Tundra Monopod provides support when you can't use a tripod. Simply attach your camera directly to the top platform and begin shooting. To make the monopod more compact, the ball head can be removed. This also allows you to attach the camera directly to the monopod. It only weights a pound, but extends to 61.4". Almost any photographer would appreciate this gift. Sandisk Extreme USB 2.0 3 in 1 Card Reader - $84.95 US: The Extreme USB 2.0 Reader provides you with a complete digital solution for your photography needs. Its performs at up to 20MB per seconds sequential read and write, above the level needed for the high enthusiast photographer. It's designed with two slots and supports CF (Type I and II), SD, MS Pro, and MS PRO Duo. It supports USB 2.0 connectivity on both Windows and Macintosh Operating Systems. It plugs and plays with no external AC power. This is quite simply one of the best card readers you can get, and a definite upgrade for just about any photographer. Whirlwind is this month's photo assignment. This can be taken so many ways: things happening quickly, life breezing by, an very energenic child. You can read more about how to submit on our Submissions page. Deadline for entry is Nov. 30, 2008. I've Taken Great Pictures, Now What? This workshop will help you decide the best way for you to organize and edit your pictures. Derrick will focus on four approaches: Adobe Lightroom, Apple Aperture, Adobe CS4, and "Roll Your Own." In this free webcast, O'Reilly Media author Derrick Story shows photographers important features in Photoshop CS4 that can improve their entire post production experience. 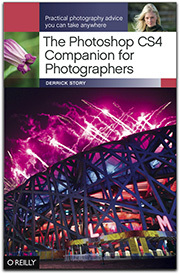 Derrick spent months working with the beta version of CS4 while writing his new book, The Photoshop CS4 Companion for Photographers. Then hosting a conversation in the O'Reilly Digital Media forums for 3 days afterward. Tuesday, Dec. 16, 2008, 10:30am to 11:30am, Free, Registration URL will be announced on The Digital Story. Where do your digital photography interests lie? Capture? Post Production? Trying to decide what camera to buy? O'Reilly Media has assembled a panel of photography experts who will give you the inside scoop on photography equipment, and the latest releases of Photoshop and Adobe Lightroom. Jan 4, 2009, 7pm-9pm, Book Passage in Corte Madera, CA. This two-day Power Tools workshop will introduce you to all of Aperture's major functions, making post production as enjoyable as capturing the images in the first place. Jan. 5-6, 2009, Macworld Expo, SF, CA. Find out more at the Macworld Expo site. The cruise begins in China, then visits South Korea and Japan. Photography courses include capture and post production. 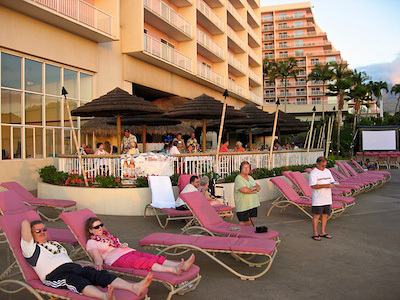 Additional tours are available as options for reasonable prices. 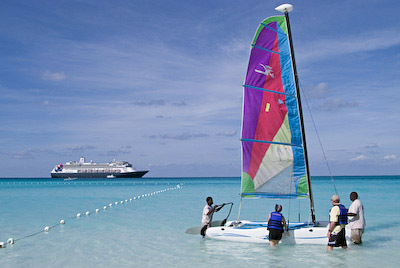 Main cruise is July 11-17, 2009. For more information, visit the MacMania 9 web site. We begin by exploring the intricacies of Raw, Bridge, and Lightroom. After that we practice building our own workflows with these tools. By the end of the week, participants have acquired a step-by-step process for uploading, rating, key-wording, processing, outputting, and archiving their photographs. With Derrick’s guidance, we learn how to take the “work” out of “workflow,” transforming these tasks into a rewarding, enjoyable part of the creative process. July 19 - 25, 2009, Santa Fe, New Mexico. For more information, visit the Santa Fe Workshops web site. When you pack for vacation, do your gear up as if you were preparing to invade a small foreign country? Do you feel the need to document every movement that family members make? Are you constantly scanning the horizon for incoming great shots? If you answer yes to these questions, you are not on vacation. I have great empathy for this syndrome. I've been afflicted myself, and drift in and out of recovery. I had a chance to think about this recently during a vacation in Maui. And this week's show I talk about balancing work and play during time off. Whirlwind is this month's photo assignment. This can be taken so many ways: things happening quickly, life breezing by, an very energenic child. You can read more about how to submit on our Submissions page. Deadline for entry is Oct. 31. 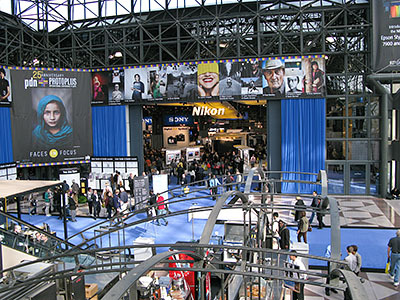 PhotoPlus Expo in NYC is one of the best photographer events on the calendar. I say "photographer" on purpose because it's really about the person with the camera in their hands who wants to improve their craft. The combination of top-tier seminars with a heady trade show floor make this a very satisfying event. I spent the week at PhotoPlus and have pulled together a recap of my experiences there, from my time in the O'Reilly booth, to teaching classes, to wandering about the Expo hall, and talk about them in this podcast. I even had time to do a little street shooting. Early morning preparations in Javits Center before the show opens. Photo by Derrick Story, captured with a Canon G9. Missing is this month's photo assignment. This can be taken so many ways. A series of objects with one missing, someone missing someone else, a clear omission... lots to work with here. You can read more about how to submit on our Submissions page. Deadline for entry is Oct. 31. Scanners are good for creating artwork as well as copying it. 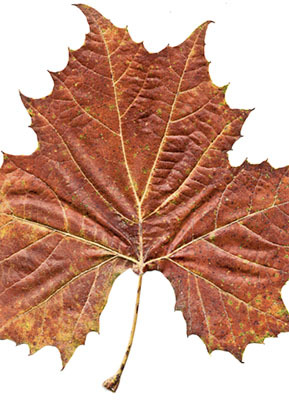 Think about how hard it would be to properly light and photography this image of an autumn leaf (shown above)? Instead, I placed it on an old flatbed scanner and started experimenting. In this podcast I talk about ways that you can put your flatbed scanner to use for creating interesting images, especially this time of year for holiday greeting cards and gifts. What were you shooting with in 1997? 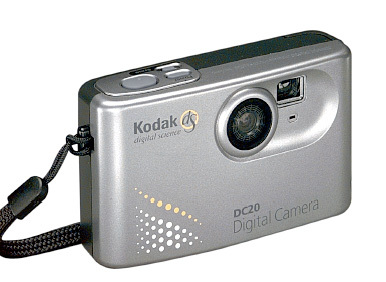 One of the cameras I had in my hand was a Kodak DC20. This primitive digital camera could hold 8 shots of sub-VGA resolution images (493 x 373). It had no LCD finder, so you had to upload the images via a serial port before you could even see what you had shot. It was focus-free, automatic exposure, ISO 800-1600. And I was fascinated with it. In this podcast, I pull the DC20 out of the closet, put a battery in it, and connected it to an old PowerBook 1400 that has a serial port and Mac OS 9, which supports the camera software. Why? Because by doing so, I'm able to actually step back into the history of personal digital photography. I take a look at the article, How to Fail as a Photographer by Allen Murabayashi. In the article, Allen, a photographer and CEO of PhotoShelter, Inc., cites some common beliefs that many photographers have, and shows how they can actually contribute to the failure of your business. Some points I agree with, and others I don't. So I walk you through the article adding my comments along the way.